1. Wet the whole surface (even though, because it is yupo, it doesn't stay uniformly wet. Water pools in some areas and leaves others practically dry). 2. Apply liberal amounts of watercolor paint. Here, I used quinacridone red, cobalt turquoise, quinacridone gold, and phtalo blue (See more information on the colors on my palette here). 3. Wipe most of the wet paint away with a "thirsty" brush. "Into Light." 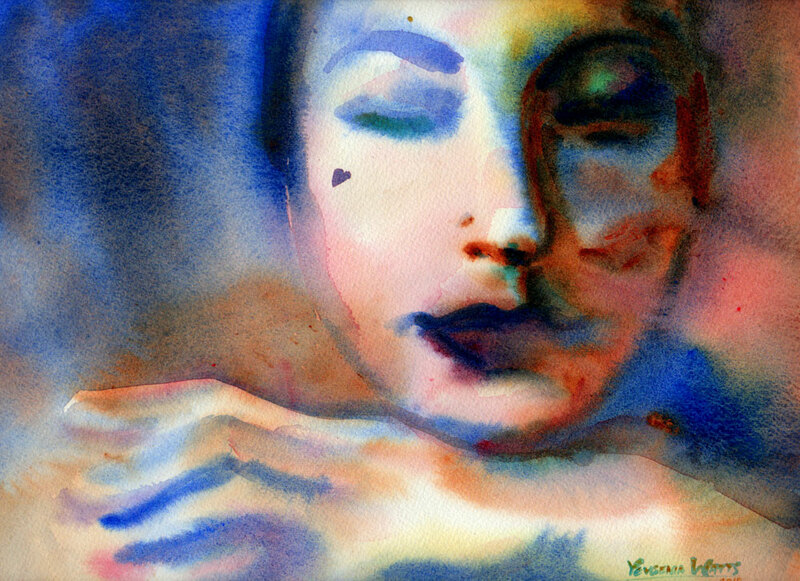 6x6" watercolor on Yupo mounted on board. Click on the image to learn more. 2. Squeezed out, either using your fingers, a rag or a paper towel. Basically, it's a brush that is not dry, but is primed with water. It is perfect for picking up the paint you might not want on your painting. I like to use round brush for that but any shape you prefer is fine, too. The closeup above shows how much paint there was initially. This is a spot which I left alone after putting paint down. Closeup below: areas where I wiped the paint off still have ghosted traces of the colors that were applied. I really like this effect in Yupo. Happy Independence Day, comrades :) Hope you are having a fabulous weekend. Mine is going fine so far. I am finally experiencing a cautious return of art-making mojo, which I welcome with open arms. Making art makes me happy. I haven't done a Virtual Paintout since last January, so this is extra special! Tallinn. 15x22" Watercolor and walnut ink on hot press paper. Click on the image to buy. ...and only after it was dry, added the drawing in walnut ink. Ummm....that's all I can come up with :) My head is running slower than usual right now, what with fireworks well into the night, kids awake on and off, and me finally getting up at 6 am. I don't think I've had a reliable night of sleep since I was pregnant with kid #1. That makes it six years! I received several questions about this painting, after posting it on my social media (are we connected? Check the icons under my beautiful face on the top right if you're reading this on my website). I will answer what I remember here. I like it for several reasons. The color is one, it looks less harsh than black India ink. I also really like the consistency and flow - it is very...liquid. What I mean is it seems like this ink will not clog the tiniest of the nibs. It's like colored water. And it's not waterproof when dry, it is very responsive to water. This can be a negative but I find it fun. Compare the figures in the image above with the finished painting. All it took is a bit of water-splashing. Check your art store. I bought my first bottle from Daniel Smith (online) and the one I use now (Tom Norton), at a Utrecht (now Blick) here in Sacramento. 3. What is that thing you used to apply ink? 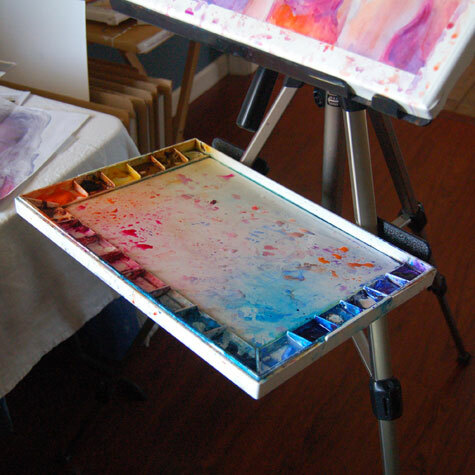 Do you let your watercolor paint dry on the palette? Or do you use fresh paint every time? Someone asked me that on my Facebook page and I thought it warranted a blog post :) . In general, I like to have freshly squeezed paint, especially for direct painting (as opposed to glazing, also known as working in layers). But it is not always practical to use fresh paint for every single painting session. So I compromise. I keep some paint in the palette wells but I don't fill them up completely (even though that usually makes the palette look better). I then add the colors I'm running out of before I paint. Or right in the middle of painting...that also happens. Fresh paint is just that, fresh. It is ready to go the second you squeeze it out of the tube. It is pure, brilliant pigment uncontaminated by the neighboring color or that sneaky phtalo blue that just likes to invade the whole palette. 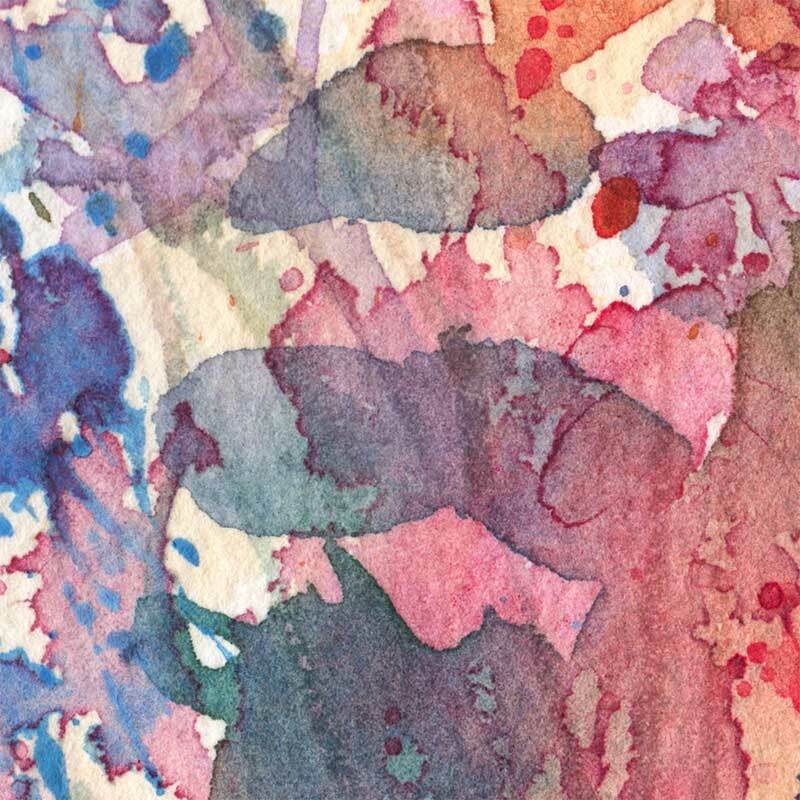 Some watercolor paints tend to crumble when allowed to dry. It is possible to re-wet and reactivate them but they can become an annoyance when you have to deal with stray lumps of pigment right where you would want a nice uniform wash. Dropping some gum arabic into the pile of paint is supposed to help with that but I don't think it's worth the hassle. Digging dry paint out of the well requires you to rub it with your brush to "break it up", which can be damaging to the delicate brush hairs (do not do it with your kolinsky sable brush). This is how round brushes lose their points. One way to go around it is to use a stiffer, cheaper, synthetic brush for just that purpose - to re-activate dry paint. Once you have a nice puddle going, you can pick the paint up with your painting brush and paint. As I am moving towards larger work or working in series on several small paintings at the same time, I find it easier and faster to cover the surface with fresh paint rather than to try to pick up enough dried paint from the well. 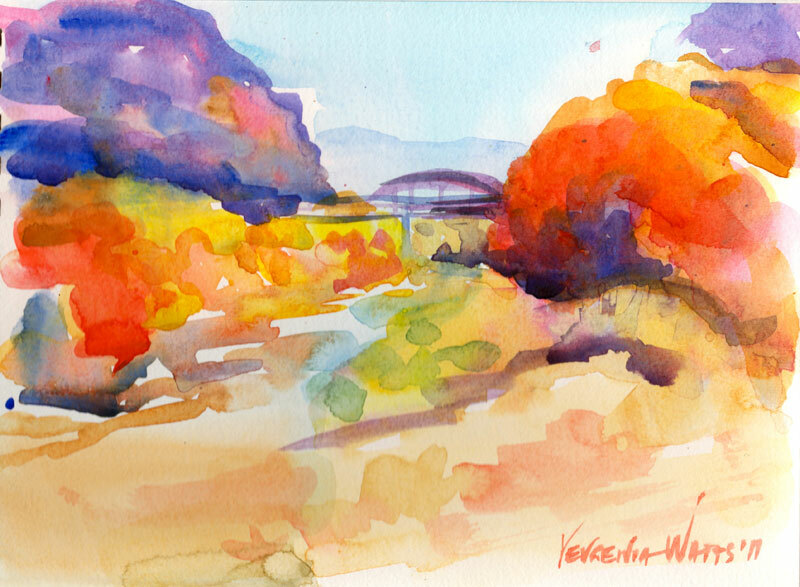 With Yupo, I often squeeze the paint directly onto the paper and then add water and mix it there. It is probably a little bit more economical. 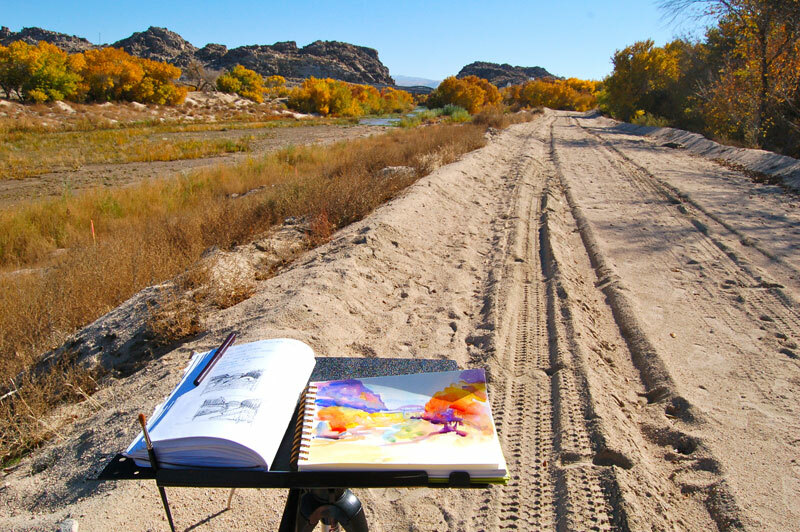 I find that it suits better for plein air and for painting outside of my usual studio work. Fresh paint tends to run and leak in transport, while dried paint, even when re-activated, seems to be more stable and less messy. I usually refill my palette wells the night before I go. This also means you don't need to bring the tubes with you. If you work small, you may not need a lot of pigment at a time. Picking it up from the dried pile in the well will give you more control than a freshly squeezed blob of paint. Depending on how you use your paints, there may be not much difference at all between using it fresh or dry. Misting the dry paint with spray or mist bottle 15 minutes before you paint will soften the watercolors and make them ready to go. Ultimately, it's what works for you. There is no right or wrong answer. How about you? Do you work with fresh paint exclusively or do you prefer to have a full palette of dried paint? It's a John Pike's palette and I'm quite happy with the number of wells, their size, and the ample mixing area. I rarely use the lid for mixing. I put it in there more out of habit than out of need. I pretty much never touch it anymore, but dixazine purple used to always come with my St Petersburg pan watercolors, so I've used it for years. Winsor & Newton Cobalt Blue. I use it when I want a slightly lighter and more opaque version ofFrench Ultramarine. Winsor & Newton French Ultramarine. The paint I should probably buy by the bucket. In the absence of buckets, I get the largest tube available (37 ml). And it gets used all the time. One of those random colors I have and occasionally use. Makes a very delicate violet color when mixed with Quinacridone Red. I have a complicated relationship with this one. I love it for giving me nice, transparent darks and brilliant greens, but I hate it for not drying fast enough on the palette and invading every single color while I'm on the move and the palette is not just sitting on a flat surface. It's also a bit of a pain to clean up and it's a staining color (so, don't put it where you think you might need to lift paint later). I am considering either keeping it in a separate container or just bringing a tube when I need it. Used occasionally. A semi-opaque, easy-on-the-eye color. Thanks to Tom Schaller for introducing me to this one. The well next to it holds the remains of American Journey Manganese Blue, which turned out to be kind of dull and very crumbly. Not at all the same thing as Winsor & Newton Manganese Blue. Daniel Smith Blue Apatite Genuine. Another random color I use very rarely. Super-granulating, bluish dark gray. I like it, I just don't often paint something that would call for it. Beautiful, transparent dark blue. Reminds me of writing ink. Daniel Smith Quinacridone Red . This is my primary red color. I can warm it up with a yellow or cool it down with a blue. It mixes well with pretty much anything. I tried this color in other brands and it works just as well. Quinacridone Magenta used to be in the well next to this one, but I found it to be a bit redundant. The other well next to it used to hold Daniel Smith Rhodonite Genuine. A pretty color, but it crumbles like crazy when it dries on the palette and I can't say it's essential. I also read somewhere in forums that Rhodonite shifts in color. Love it! Apparently, I also need a new tube of it. Again. The color is a nice rusty orange. Transparent, mixes well with most colors on my palette. Not to be confused with DS Quinacridone Burnt Orange, which is actually a rather boring brown. A basic orange color, semi-opaque. Not used very frequently but is good to have when I need an intense orange. The well next to it is the above-mentioned Daniel Smith Quinacridone Burnt Orange - which is not an orange at all, and I will be scraping it out and throwing it away. Next one is my primary yellow well. A bit too brown and boring for my taste, so I will be scraping that one out, too. A good color to have, but not a necessity. Quite opaque and tends to get chalky. Winsor & Newton Quinacridone Gold. Another color I buy a lot of. Wonderfully transparent, somewhat greenish yellow. I tried it in other brands, trying to find the same thing but cheaper, and was less than impressed. Winsor & Newton it is. That's it! I also own a box of St Petersburg (Yarka, White Nights) pan watercolors, with some pans already emptied and refilled with other stuff, for trips and such, when I would not bring my large palette. What about you? What are the staples on your palette? P.S. 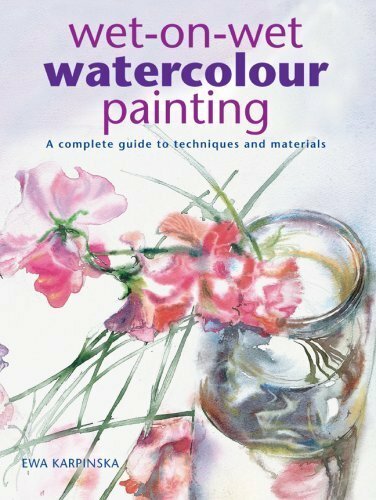 For an excellent concise overview of different watercolor brand paints, check out this Wonderstreet article. 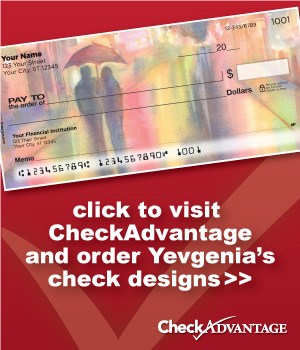 Let's assume you already have a nice, high-resolution, color-corrected digital image of your artwork. I scan most of mine, photograph those that can't be scanned and then adjust the color using Photoshop. I use the same printer (Epson Stylus Pro 3880 Color Inkjet Printer) and paper (Epson Ultra Premium Presentation Paper MATTE) that I do for my open edition prints. Probably not the most cost-efficient choice, but the quality of image is superb and I like the fact that these cards are "frameable." I suspect that a regular home office printer capable of printing color photos should be able to do the job. 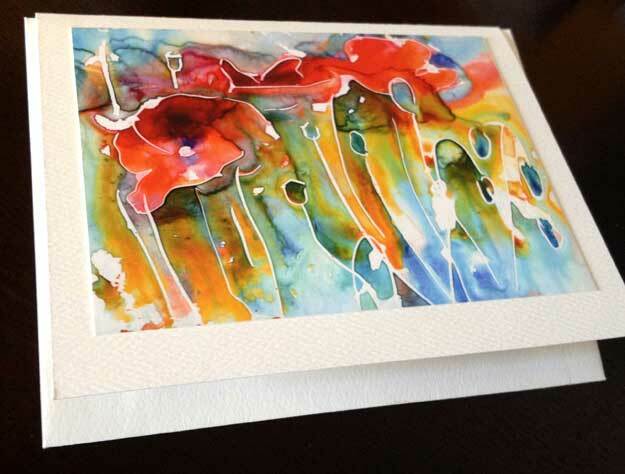 I print the images a bit smaller than the dimensions of the card, so that I have space for the signature and the border. Once again, lots of choices here. I tried about ten different kinds and found that I like Avery Personal Creations Textured Heavyweight Note Card and Envelopes, 4-1/4 x 5-1/2, 50 per Box (3379). 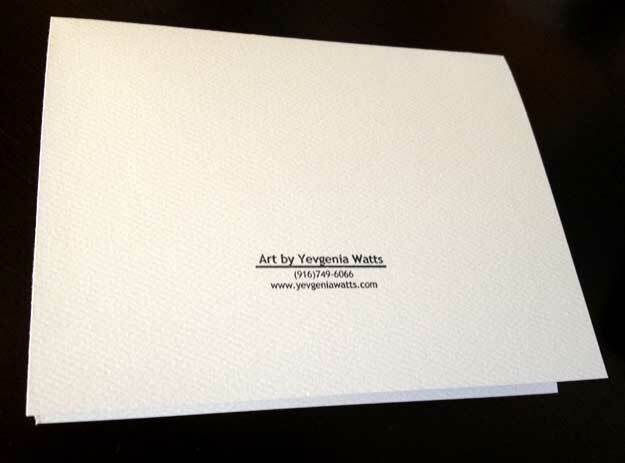 They have a nice watercolor-paper-like texture and you can print on them using a desktop printer. I printed my information on the back of the cards before I began using stamps (see below). For attaching the print to the card, I use ATG Tape. I also happen to own an ATG Tape Dispenser, which is not a requirement but it definitely speeds up the process. On the back of the card, I put my artist information. 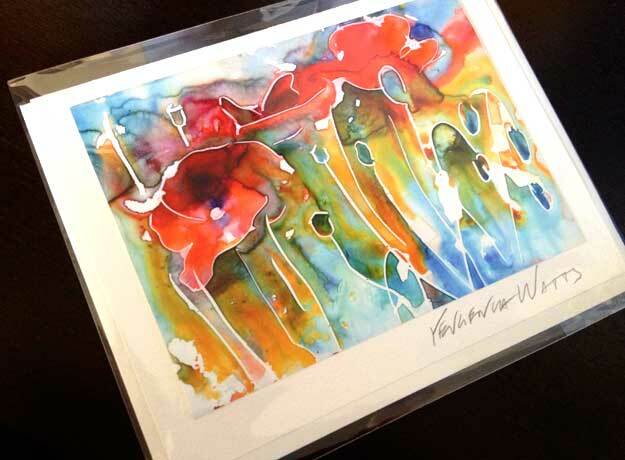 This can include the artist's name, the painting title and medium, website, email address, phone number, and even your photo and artist statement or bio. I use a stamp I ordered through Vistaprint.com with just my name, phone number, and website address. 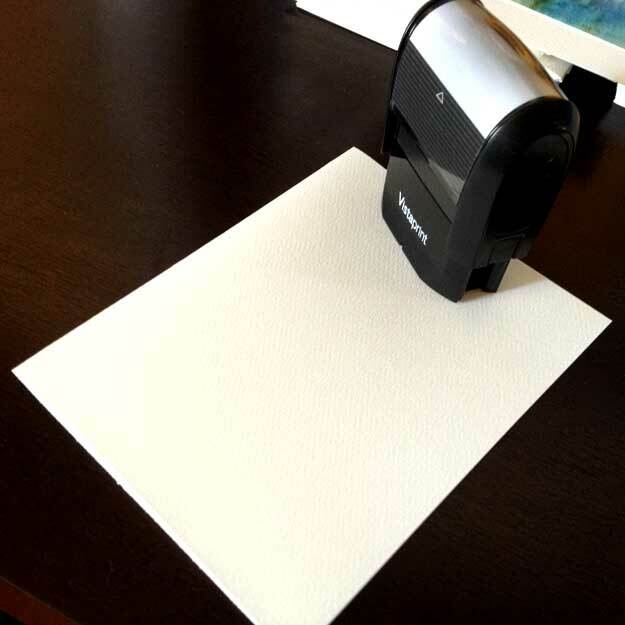 I find it a whole lot easier than printing on the cards using a desktop printer. 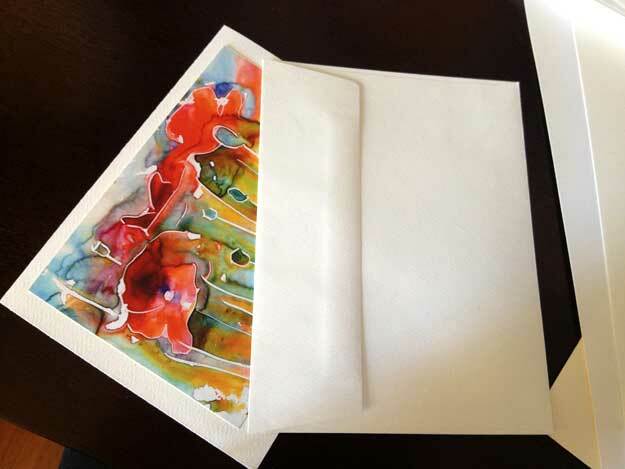 I package a finished card in an acetate envelope that is a tiny bit bigger than the card. 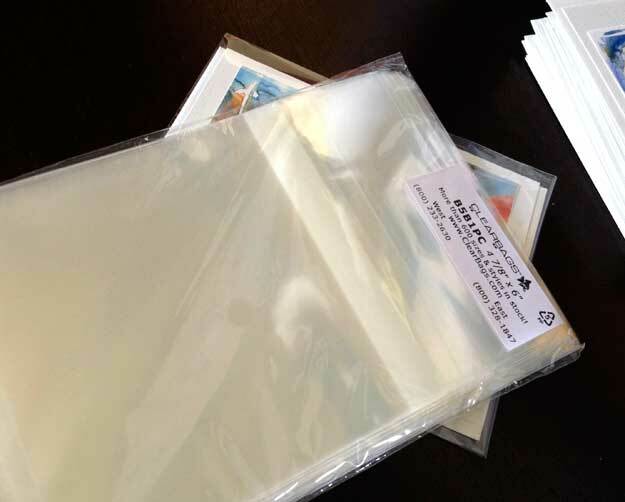 I buy those through Clearbags.com but they are also available at art supply stores and even Amazon.com. Questions? How do you make your cards? Leave me a comment below! Here is an unusually logical continuation to my previous post about Lake Arrowhead! :) Remember those prickly flowers that my husband heroically picked for me (five years in the military have not been for nothing)? Well, I brought them home, of course, and painted a couple of still lives with them. This is the only one of them that I liked enough to show to the world. hard edges, saving the whites. splatter, layers and layer of it. Opaque manganese blue on top of transparent layers. I mentioned in a previous blog that I'm not really a huge fan of most art. My wife and I have been married for over three years now and I think I can count the number of art events that I've attended with her on one hand (I know.. I'm a bad husband). But, I'm a changed man. No, I still don't care too much for the majority of the art, but mention a show and I'm in. Why's that? The booths. I think my wife and I make a pretty good combo. I don't think that she could do, or would do, the business side of art by herself and I certainly can't make the artwork, but together, we're on our way towards making this a real business (granted, a very slow-growing one). So, whenever we do attend any kind of art event, or even just a street fair or swap meet, I've got my eyes open for new booth ideas. How to display product, how to interact with customers, what might sell and why, and try to apply those ideas to our own set-up. It was also through looking at other booths, both in person and online, that we found out what all we would need in order to create a professional looking booth of our own. "One must have money to make money" - I always thought this old adage was more true than is convenient, but in this whole process, I've found that there is a loophole nowadays that goes something like this... "One must have CREDIT to make money".. I'm not sure of the financial wisdom of our business creation process, after all, we've basically taken a 9.9% APR loan for most everything that we've purchased. A smarter person with a more structured business plan might have simply applied for a small business loan but we used credit. Either way, here's what you can expect to spend to get started with a set-up similar to ours. Canopy - the first and most important (and expensive) part of the set-up. Though you can buy a standard 10x10 pop-up shelter for quite cheap, the quality will be quite cheap as well. For the random event and light use, it may be fine, but we opted to go all out and get the professional version for durability (and to remind ourselves that this is a business, not a hobby). Our frame is the EZ-UP Eclipse II model which is $675 from EZ-UP Direct. Since we bought our frame from a friend without the top, we went through California Palms for the top and sides. Their prices are great, the fabric they use is thicker than most others and they offer their "four-seasons" top ($140) which has air vents in the fabric. This helps a bit with the heat but primarily allows the wind a place to escape without picking up and tossing our canopy. Sidewalls are not a necessity per se, but I believe that it really completes the booth and gives it that professional look. They also block the sun, wind and rain, keeping your booth somewhat protected from the elements though they can increase the temperature inside the booth a bit. We leave one of the back corners open a bit to facilitate air flow. Our sidewalls ($280) were purchased from California Palms along with our top. Though their sidewall prices seemed a bit higher than the competitions, I am quite satisfied with them. They are flame-retardant. 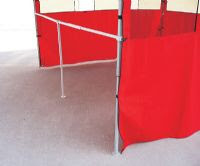 Each panel zips to the neighboring panel, but there is also an additinal strip of fabric that velcros the two together, providing extra strength. Most fairs, shows and events require that you have a canopy and many require that it be white, so be cautious of buying one in a different color. Many municipalities also require that it be fire retardant. A typical booth space at an event is 10ft x 10ft so I recommend sticking to that standard size. Tables & Chairs - We spent a surprising amount of time looking at various tables and sizes. Do we go with two 8 ft tables and one 6 ft, four 6 ft, etc. We wanted to have some freedom to mix and match so we could change our set-up as needed and neither of those options seemed great. Also, most tables were 30 inches wide, much wider than I thought we needed. Having one such table on each wall would mean that our "floor" space would be greatly reduced, making the booth feel smaller than it is without really giving more display room. 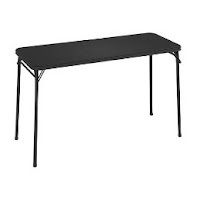 Eventually, we found some great folding tables ($30) at Target and Walmart. They were 48" x 20", so they could be re-arranged however we wanted. They were narrow enough that they didn't take up too much floor space. They are light and fold down quite thin, yet are strong enough for what we are using them for. 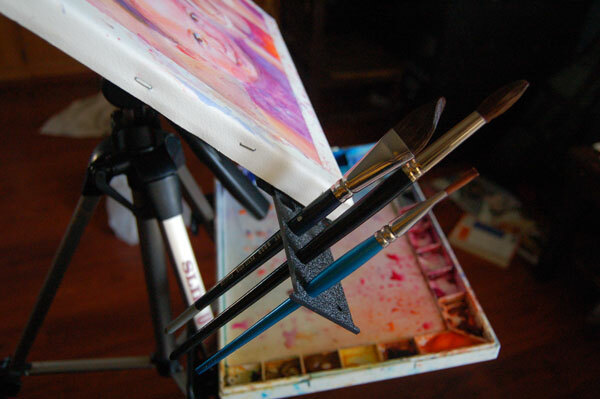 We even found a matching smaller folding table for my wife to place her easel and art supplies on for the shows. For table cloths, we went to the local fabric store and browsed their remnant and clearance racks. We found a wonderful blue fabric that my wife then made the tablecloths with. They look great and bring a bit of class to the set-up. Chairs were easier to chose of course. We bought two folding chairs ($60) and a folding stool ($20). My wife usually works on the stool at her little painting table while the chairs are used for myself and anyone who stops by for an "on-the-spot" painting. Print Racks - We needed a way to display our prints so we began searching the popular art catalogs. I was astounded by the costs of print racks! To be such a simple piece of equipment, the cost was really high. So, being the cheap (wait, I mean "money-concious") person that I am, I decided to just make my own. I went to Lowes and purchased some 1" x 2" Redwood boards, some brass screws, brass chain, stuff to make the pivot point and stopped at Wal-Mart to buy some black canvas (should have gone with white). A few cuts and screws later and the frame was made. Genia was sick of sewing table cloths by that point, so I cut and made the canvas part myself and affixed it with brass screws. Easy job (about $20 each). We made that one large enough to hold our largest prints which are 24" x 30" matted. For the smaller prints, I decided that an elegant display solution would be to use tempered-glass display cases. The glass panels are available for purchase individually so you can create whatever size you want. Here is a website that lists the available sizes and prices. Overall, they were cheap and easy and do a nice job and displaying everything up to 16" x 20" matted. ($15-$20 each). affix to the canopy and the frame-rails to give us our "wall" to hang pictures on. Grid panel, being steel wire, is quite heavy, so it was nice only having to buy 2' x 4' sections which sit on top of the frame-rail. We purchased 12 panels total, four for each wall. Lastly, we bought some grid-panel hooks that are great for hanging pictures from. After a few uses, we found out that putting the grid-panels up and taking them down took longer than any other part of the booth set-up. So, I decided to simplify things a bit by using zip-ties to connect each set of two panels together. This meant only having to make six trips instead of twelve. I also bought a roll of Velcro One-Wrap to make some velcro fasteners for the grid-panel. I used two where the grid-panels connects to the top of the canopy, and three where it attaches to the frame-rails. Now, I can take the grid-panel off and leave the fastening system attached. Saves quite a bit of time and zip-ties. Other Stuff - We decided that fine art greeting cards might be a good product to sell, so we purchased a 48 slot card rack ($49) from RobertHam.com. Its nice and light, assembles and disassembles very quick and does a nice job at displaying our cards. We bought our picture frames (appx $250) from Aaron Bros, using their 40% off-coupon. Unfortuately, those coupons are only good for one item, per person, per day so we spent about three days going to all of the Aaron Bros in town to get the amount of frames that we needed (did I mention that I'm money-concious?). We still aren't sure we like the ones we bought however. They look pretty good, but the frames have a tendancy to scratch easily. Regardless of what you get, I recommend cutting some cardboard "spacers" to go in between frames when they are packed for storage or transport. If you don't have a bag for your canopy, I highly recommend one. Our canopy bag ($50) is one of the rolling type, which I also highly recommend, especially if you followed my example and bought an expensive, professional canopy. It turns out that "expensive" is synonymous with "heavy" as our canopy weights in at over 75lbs. Wheels make transporting it much easier and it also protects the top from damage. We purchased a canopy awning ($88) along with our the other items we got from California Palms. While it is not an essential item, we felt that it would entice more people to visit, or at least loiter in front of our booth by providing a bit of shade on those warm days. It does seem to work for that purpose and it also provides some extra sun protection for the artwork, especially since the print rack and card rack sit out from under the main canopy. With concerns of wind damage, I made some braces for the awning that should help to hold up to most of what we get up here. Oh! Almost forgot the sand bags... If you will be showing in an area that occasionally gets even moderate wind, you'll definately want to invest in some good sand/weight bags for your canopy. There are a number of different styles out there. We opted to go, yet again, with California Palms. Their weight bags ($50 for 4) are made of heavy duty canvas with velcro on the sides to hold it to the canopy legs. What I like about them is that they already have the straps attached to fasten them to the top of the canopy frame. This means that you don't have to worry about bringing extra straps along and with these being nylon, they wont stretch and allow the canopy to move like bungie cords do. Two more things that are helpful, though not essential, are some big storage boxes ($20 each) that we bought from Lowes and a hand truck ($100) we bought from Costco. The storage boxes provide an easy way to keep all of our prints, cases, accessories, etc together in one place, and makes for only two trips to the van instead of half a dozen, and the hand truck is great for those events where you can't drive up to your space to unload. One last thing... The van. We have Subaru Outback that we used once to transport all of our stuff with. Granted, we had our son with us, but even without him, we would have had to strap stuff to the roof. As such, we've invested in a 1997 Chevy Astro Van. They are pretty reasonable to find used, have a great amount of cargo space (we leave the middle bench seat in and still have enough room) and drive pretty much like a car. We considered getting a full-size van, but my wife wouldn't have felt comfortable driving and parking something that large. 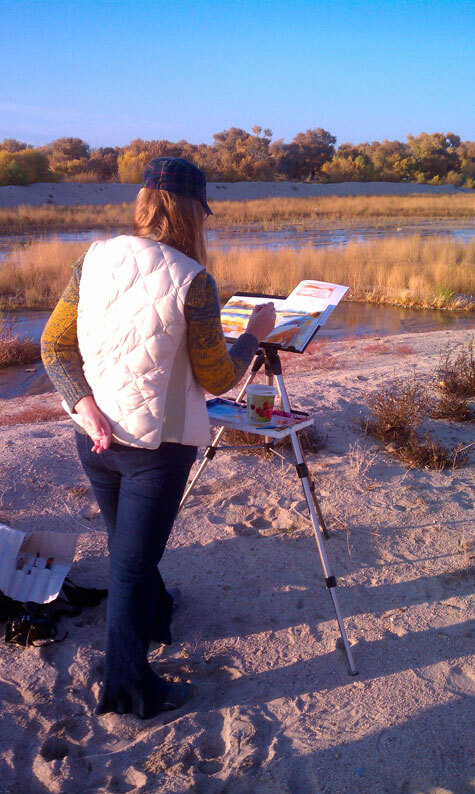 Art shows, fairs, swap-meets, exhibitions seem to be a part of life when it comes to starting out as a professional artist. While it can be boring and tedious, not to mention discouraging at times, you can improve your chances by having a professional looking booth set-up. So, there it is, all (or most) of what you'll need to create a decent looking booth set-up. Back in the day when I was looking for a perfect watercolor paper block (I came to the conclusion that I just use too much water to work on blocks) - I got this little 4x8" block of Fluid watercolor paper to try. I liked the unusual format. The paper itself performs ok, at least in this size. It does curl and buckle a bit but overall it was quite suitable for my purpose (to play with little imaginary landscapes). I might not get more of it, but I won't throw it away either. "Fog." 4x8" watercolor on Fluid CP 140lb watercolor paper. "Autumn." 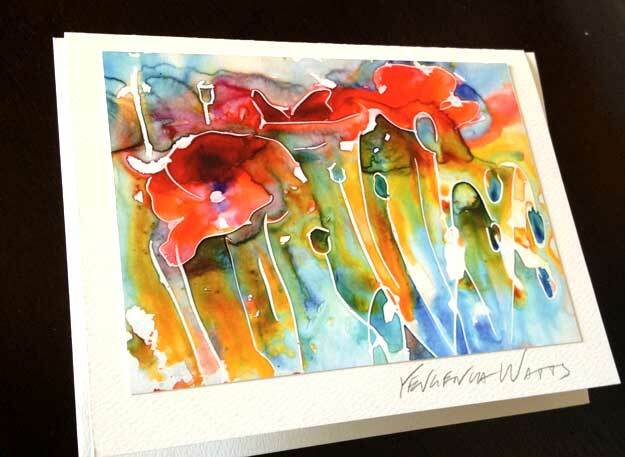 4x8" watercolor on Fluid CP 140lb watercolor paper. Like this post? Get more like it? 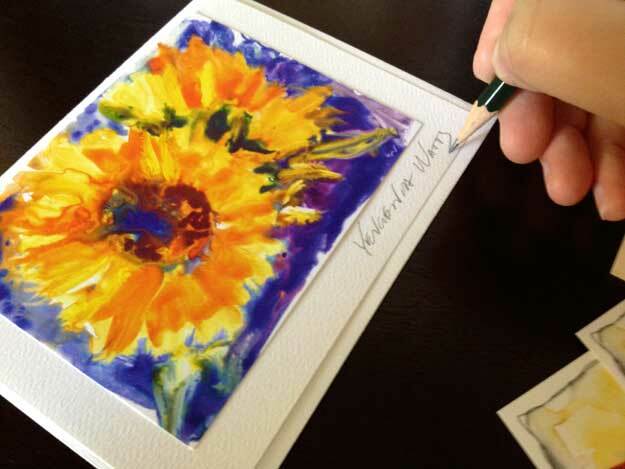 Watercolor on Canson Montval CP 140lb, treated with acrylic gloss gel medium in some areas. 9x12". Photo reference: Angela from Julia Kay's Portrait Party. For those interested to know what "treated with acrylic gloss gel medium" means, here is what happened. After I decided on the composition, I wanted some extra texture in her hair. I accomplished that by taking some gel medium and brushing it on the blank sheet of paper with a 1" bristle brush. You can see the lines in the upper and lower left and grain throughout the painting. 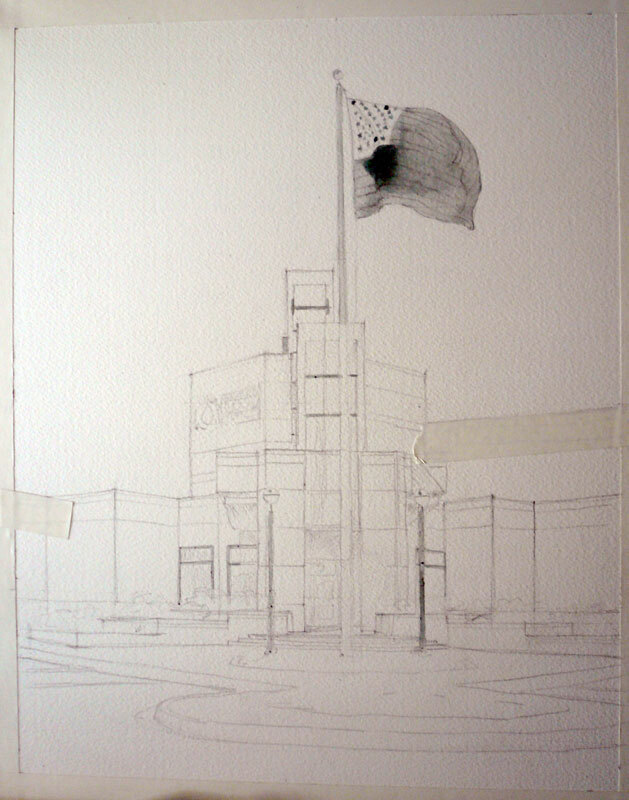 The lines are the result of a little more medium on the brush; the grain effect happens when you drag an almost dry brush across the paper and the medium catches only the very top of the paper grain. I uploaded a larger than usual image for you to see the texture close-up. Needless to say, I would be very upset if somebody used this image for their own commercial purposes. So don't :). Bell Peppers - watercolor and crayon on Yupo video! Watercolor and wax crayon on Yupo synthetic paper. Watercolor and oil pastels on Yupo synthetic paper. The first and last ones have oil pastels as resists. This month we (the diverse bunch of artists participating in Virtual Paintout) went to Canary Islands. Thanks to this awesome monthly project, the list of places that I have to visit, keeps growing...And I get to paint street scenes - which is not very feasible when you live in the middle of nowhere and have a small baby. So, this is Aquabord. I'm not sure yet how much I like it - but it definitely has some advantages. First, it is a board. It is rigid. It does not require matting and frame is optional. It is super easy to lift watercolor (ink too, but I found that to be a little harder. You can end up with grooves on the surface). What I'm not so happy about is that, using my normal amount of water, the paint dries way too fast and doesn't really run and blend and do all that watercolory stuff. Maybe I just need more water.